And many of the people pinning the recipe on Pinterest said the same thing. 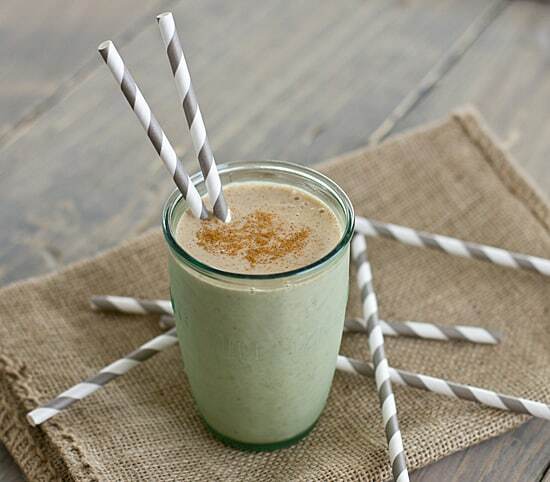 I’ve never bought protein powder, but I figured if everyone else was doing it, it must be a good idea, so when I first tested this Banana Chai Breakfast Shake recipe, I used protein powder in it. But, like our moms always tell us, just because everyone else is doing it doesn’t mean that we should do it too. Because the protein powder? Was gross. Sorry, guys. You can add protein powder to this recipe if you want to, but it’s just not for me. What am I missing?! It’s bitter. So terribly, terribly bitter. Despite the lack of protein powder, this recipe does still have protein from almond milk. And it also has the delicious flavors of chai–in shake form! Like my original breakfast shake recipe, this is a quick and easy breakfast, but it will fuel you for the long-haul. When you start the day with a breakfast shake like this, you’re not going to get the mid-morning hungries. 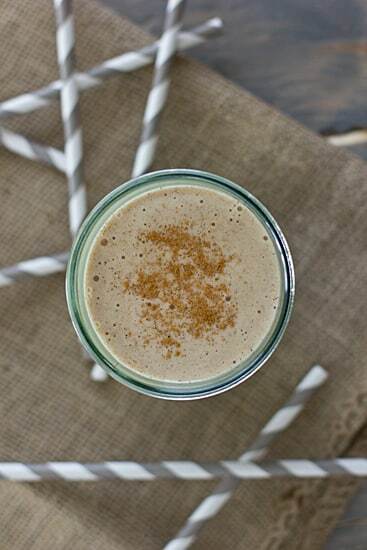 A creamy, filling chai-spiced smoothie. It’s like having a milkshake for breakfast! Combine tea, milk, oats, cinnamon, 1/4 teaspoon ginger, 1/4 teaspoon cardamom, and cloves in a resealable bowl. Stir together and refrigerate overnight. Making the oat mixture ahead of time and refrigerating it overnight softens the oats and gives the shake a smoother texture. If you’re feeling impatient (or don’t mind lots of little bits of oatmeal in your shake), you can make this without that step–put the oats in the food processor or blender first, process until it becomes a fine powder, and then add the rest of the ingredients. I made your Chai breakfast shake this morn. It was a nice change of paste. It was surprisingly filling too. I usually make my morning shakes out of Almond milk, fresh spinach, and frozen bananas. The picky GRANDchild didnt give it a chance. (She won’t eat meat either.) I wished I could be like that. But the other GRANDchild lived the shake. LOLs! Thought you’d like to know I tried this. Just want to add a comment about protein powders: they are NOT all created equal. Even some of the ones that sound like they should be good are not, either because of texture or flavor. We have been using Designer Whey, only in flavors that are sweetened with Stevia, and it has been very good for us. The vanilla and double chocolate flavors are the best. Obviously, if you are vegan this would not work. But if you are not vegan, this is the best we’ve found. The flavor of this recipe sounds wonderful. I would add protein powder, because I need a good amount of protein. And I would have to substitute for the black tea (probably would use red rooibos) since I can’t do caffeine. Hopefully that wouldn’t change the basic flavor too much. I will be trying this. Your reader Marie Marley pointed me to you. I love chai. I might just have to give this a shot. Adding protein is not about the flavor. You aren’t missing anything. Yes, protein is bitter. If it’s not, it probably has more sugar added than is helpful (unless, like Susan, it’s sweetened with stevia). People that add protein to their smoothies do it for dietary reasons. Athletes of all stripes, strength trainers in particular, and dieters often need to take in extra doses of lean protein, and whey is a handy source. They’re often looking for ways to mask the bitterness and make it palatable. I often blend mine up with milk, ice, and bananas or fat-free yogurt. This smoothie probably is a good candidate for that purpose. If the protein is caseine, that tends to thicken up fast and hard when agitated by things like blending. So protein users are advised to use it sparingly, blended with other proteins, and/or with additional water or other liquid to loosen it up. There you go. More than you wanted or needed to know. Oops. That’s Marie Hopwood, not Marie Marley. Old habits die hard. Yup, I always tell people they can add protein powder if they want to, but it’s just not for me. But the great thing about smoothies is that they’re easily customizable to different tastes and nutritional needs! Almond milk has almost no protein – about 1 gram per cup. I add Wellness Whey protein powder to smoothies, either vanilla or chocolate flavor, which I get from my nutritionists at Nutritional Weight & Wellness in St. Paul, MN. It is never bitter & not highly sweetened. As Susan said, not all protein powders are created equal – this is one of the best. Ooh, now I know what I’m having for breakfast pretty much every day now. I can never decide whether I want hot chai or a smoothie, and it doesn’t seem to make sense to do both separately. But together…yes! On that scene, I love protein powder haha. Is that natural or harmful if I drink this chai 3-4 days a week? Since I am not smoothie lover. Thanks for the sharing though! !